The chemist chain Alliance Boots has been accused of exploiting its suppliers to improve its cash flow. The retailer wrote to suppliers saying that invoices would be paid up to 75 days from the end of the invoice month, instead of 30 days previously. In addition, the company decided to start charging a 2.5% "settlement fee", which is a charge for paying the bill. 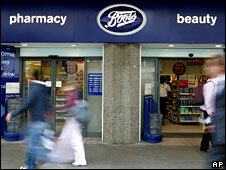 Boots said it was seeking to align its policies with those of Alliance Unichem following their merger in 2006. Alliance Boots was subsequently bought by private equity firm Kohlberg Kravis Roberts for £11bn last year. "We are committed to working with our suppliers for our mutual long-term benefit," the company said in a statement. "Our procurement strategies are in line with other groups of similar size and scale." But the Federation of Small Businesses (FSB) criticised the policy. It pointed out that waiting 75 days from the end of the month in which the invoice was received amounted to a wait of up to 105 days, up from Boots' old terms that involved payment in 30 days. "Big companies appear to be aware that small businesses are afraid of taking them on over payment terms and are abusing their power as a result," said John Wright, FSB national chairman. "Making small businesses wait 105 days for payment and charging them for the privilege of doing so is nothing short of outrageous." One of the suppliers who received the letter from Boots was Justine Thompson, director of MTA International, a supplier of management training resources. "If all the big companies that we deal with treated me in the same way I'd soon be out of business," she told the BBC.